The United Nation’s Millennium Development Goals (MDGs), adopted in 2000, set a historic precedent of global mobilization to achieve a set of important social priorities worldwide. The MDGs expressed widespread public concern about poverty, hunger, disease, unmet schooling, gender inequality, and environmental degradation. By packaging these priorities into an easily understandable set of eight goals, and by setting measurable and time bound objectives, the MDGs helped promote global awareness, political accountability, improved metrics, social feedback, and public pressures between 2000 and 2015. The post-2015 unanimously adopted development agenda known as Sustainable Development Goals (SDGs) pick up where the MDGs left off. While we have made great progress to address world poverty, we still have much to do to eradicate poverty and hunger and promote sustained economic growth, helping people everywhere to thrive. 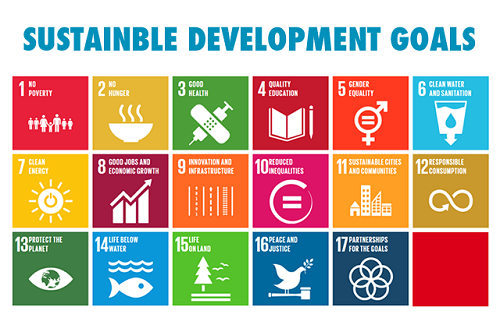 The Sustainable Development Goals position all countries, regardless of their development status, to address existing concerns either nationally or internationally. The SDGs promote a universal approach to development, growth models that decrease inequality, scaled up interventions, and cross-sector coordination and collaboration. While the 17 SDGs can be seen as a broad agenda, we can leverage our Rotary network to devise targeted sub-goals for community-led projects. By working in partnership with marginalized communities in both developed and emerging markets, we empower underserved communities by implementing more sustainable economic and community development projects. We learned key lessons from the Millennium Development Goals in relation to addressing economic and community development projects. We see a critical need to increase agricultural productivity and access to markets for farmers in Africa. We also see a need for more private sector jobs, especially among micro, small, and medium-sized businesses, globally. Every community can benefit from creating access to local investment, entrepreneurial training, and business networking for better and more inclusive jobs for youth and women. For the Sustainable Development Goals (SDG) to be reached, everyone needs to do their part: governments, the private sector, and civil society. We can leverage our largest asset, our vast Rotary network, by bringing together all community stakeholders to make Sustainable Development Goals a reality for a better world. Sachs, J. (2012, June). From Millennium Development Goals to Sustainable Development Goals. The Lancet. Vol 379: 2206–11. Poverty is the mother of crimes and poverty can only be eradicated through educating the girls of tribal areas of FATA Pakistan. The dream of the tribal women and children is peace and progress all over the world.